Yesterday was a red letter day because it was my first "Fashion Night Out" in Paris thanks to Sylvia of "Finding Noon". Just as Sylvia promised in her post "La rentrée", it was a glorified block party on the rue du Faubourg Saint-Honoré where fashion houses uncorked champagne until it flowed in the streets. It was also the people watching highlight of the year. Put on your fancy clothes and join Sylvia, Mlle Ella Coquine, E and me for a fun night out on the town...Parisian style! 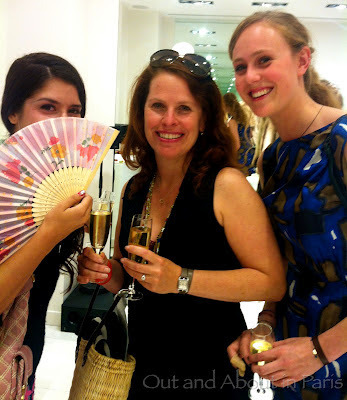 Mlle Ella Coquine peeking out from behind her fan, Sylvia and E with our first glasses of champagne. Too risque for Paris? I guess so because the police told the models at La Perla to go inside the boutique. They did...and returned a couple of minutes later in swimwear. That had everyone moving to the music! And all too soon, the evening was over and it was time for the fashionably dressed to have one last kiss before they headed home in their staggeringly high heels. 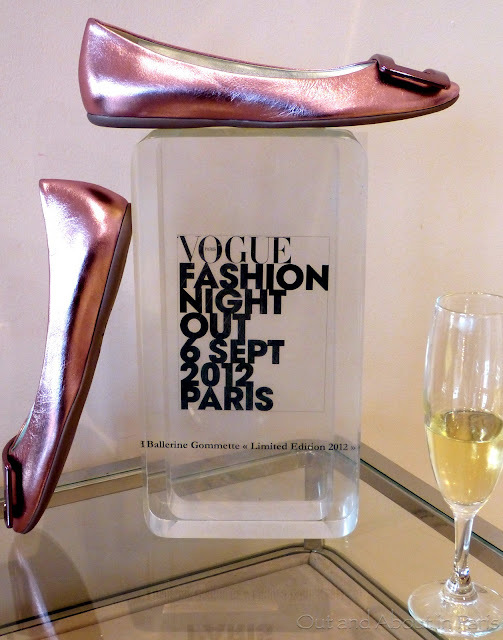 Many thanks to Emmanuelle Alt, the editor-in-chief of Vogue Paris, and Sylvia for a fantastic Fashion Night Out! Sooo much fun!!!!! Great shots and a huge thank you to Sylvia for inviting us!!!! The picture of the couple came out really nice. Bravo! Again, so much fun!! I'm amped up for Fashion Week now! I know, it was so much fun! It was also interesting to read Sylvia and your blog posts and see what caught your eyes during Fashion Night Out. I'm happy that you included your video of the band at Roger Vivier. Watching it brought the evening back with a bang! Did you feel your ears burning because your name was mentioned when we talked about our favorite bloggers in other parts of France? We also wished that you would have been there to clink champagne glasses with us! Happy you were able to attend! Love the "kilt" oh la la! Me, too! It was quite an experience - kilt and all! I walked home last night in the midst of it all--Marc Jacobs giving out fingerless gloves, champagne and music at Ugg, TopShop ablaze and even the Hershey chocolate store getting in on the act. Honestly, I texted a friend and said I couldn't tell the difference between Fashion Night Out and Halloween. But the energy was high, people were having fun and I was just tired. It looks like you had a great time. And of course there's always a loving couple in the middle of the street in Paris. I am surprised that lingerie was too saucy for the street, but then again, it's a short distance to "streetwalker" in such a get up. Yeah, it was a bit like Halloween here, too. It seemed like the perfect opportunity to wear something you normally couldn't get away with. 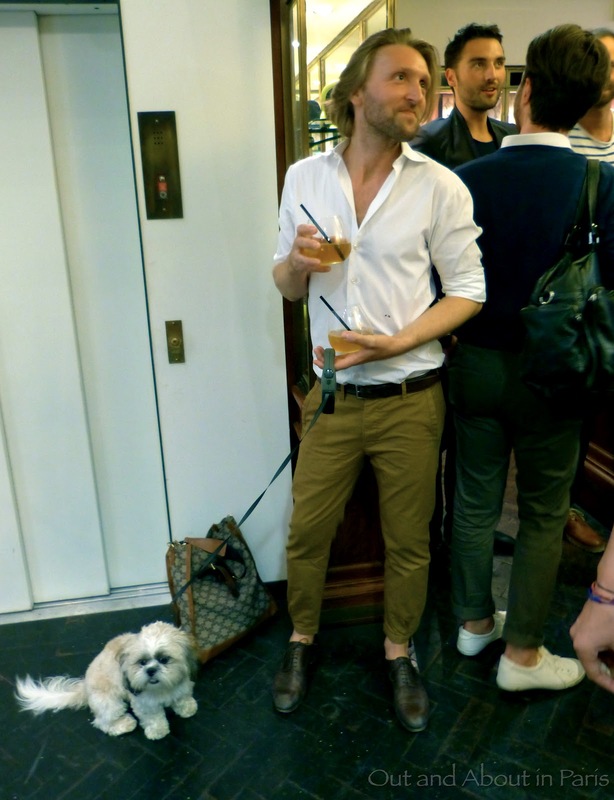 Did you take any photos of Fashion Night Out in Chicago, Joseph? I'm particularly curious about what they did at the Hershey chocolate store. What fun, folly and high jinx Mary Kay! It was all of that and more, Baron Akers! Looks like a very exciting evening. You ladies continue to attend the coolest events in town! Sylvia's knee was really sore and bruised. It's a shame that she had such a hard fall because she was planning to run in La Parisienne on the weekend. Judging by the photos on her blog, her camera survived the fall! But what did you wear?! I took Sylvia's advice and wore something black to stay in the background. Well, tan and black. Very discrete! 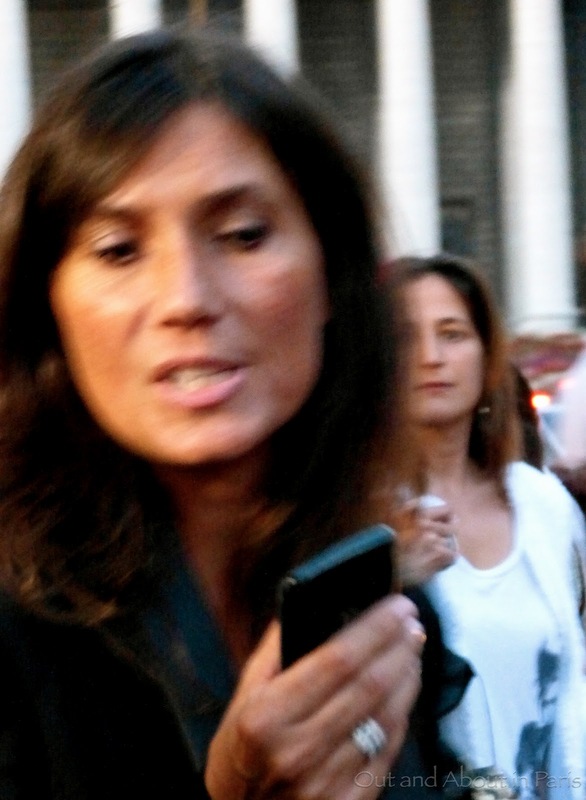 ;) Emmanuelle Alt, the editor of Vogue, was in jeans and a blazer. Looks like you had a great time. Here's a few photos of my FNO. Thanks for sharing the link for your pictures of FNO in New York City! I really enjoyed seeing them after hearing about what it's like from Mlle Ella Coquine. When are you going to start writing a blog?! You really should! Please click here to see nycgirl's photos. wonderful pictures of what seemed a great night. Very lucky girls. Oh, La La!